Finest quality calf skin banjo heads at affordable prices. BANJO VELLUMS. A QUALITY PRODUCT AT A REALISTIC PRICE. A very good product for the price. Helpful seller answered questions promptly and efficiently. I will certainly use again. BANJO HEADS NATURAL CALF SKIN. A QUALITY PRODUCT AT A REALISTIC PRICE. A complete novice & first ever attempt to replace a vellum. It was a great success with no problems. The instructions were easy to follow even for me! Cheers Terry. Good quality skin and clear instructions for first timer. Buy with confidence. 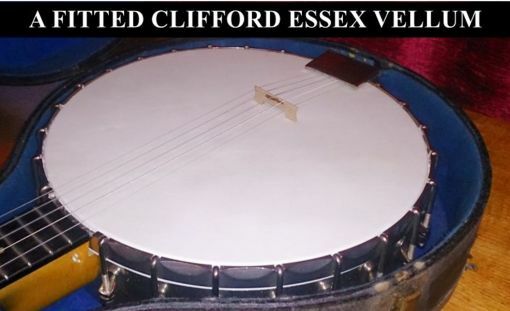 I have been using Clifford Essex banjo skins now for some time. Its a great product at a great price, will be buying more for all my banjos and ukulele-banjos, you can not buy better, plus you get excellent service thank you. Pauline. I am wring to thank you for the excellent service and quality of the parts you sent me. I have played banjos for 50 years semi professionally and have a collection of pre war beauties and I know how to get the best out of them. The calf skin is excellent and the instructions were very helpful even though I have fitted skins before. Now I know that I can get quality skins I am tempted to take the plastic head off one of banjos and get it back to the state it was designed for. The Special Hand Made Bridge is perfect quality and gets that bright sound without overtones. It is ideal for my plectrum and tenor banjos. In the past I have had to do all the sanding myself and ended up with much the same shape as you sent but the maple was not of the same quality you supplied which makes a big difference. Absolutely perfect brilliant instructions, panic free fit. Hi there. I first bought a calf skin vellum skin to put on my Keech Banjulele at a more expensive price than this one. It was nice & did the job well... until my partener dropped a tool on it in the workshop & made a hole in it!! It had been a larger size, the only size on offer. I looked for a replacement & was well pleased when I found this one, a smaller size & substantially less money. Today, my partner has replaced the head with this vellum & the net result is beautiful. This is even better quality than the first one & the Banjolele sounds brilliant. I would recommend this skin for banjo heads any day. No bad points that I have found. CALF SKIN BANJO VELLUMS. 10" - 15". NATURAL.